I am not a fan of architectural photographs. Intellectually, I know that skyscrapers are marvels of engineering, science and technology. But as photographic subject matter? Eh. I find them cold and uninspiring. Steel towers of glass and concrete cast shadows that look the same whether in Tokyo, Toronto and New York. This is particularly true on week-ends when the buildings are empty and the streets are silent. I went to Shinjuku’s skyscraper district on our last day in Tokyo. It was a wet and wintry Saturday, so the streets were mostly empty and although there were people around, they were in the station and underground walkways. Above ground, taking photos of the buildings, I tried to inject life and depth into the scene. In one case, it involved framing the shot and waiting for someone to walk by. In another, it was capturing skeletal trees and reflections. However, I found the photos disappointing. They looked exactly like it felt. Chilly. Cold. Sterile. I probably would have trashed them all, if I hadn’t taken an accidental walk through some tombstones. We’d seen a neighborhood cemetary from an overhead viewing deck. Tucked in between buildings and hidden from the road, it was unidentified on maps but obviously old. The burial plots were covered with moss and worn smooth with age. 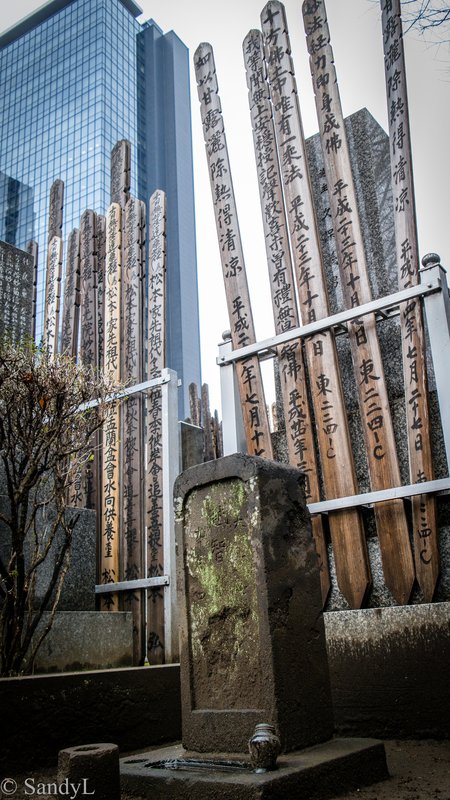 The wooden sotobas, neat and straight, offered a warm visual contrast to the dark stone. Together they were monuments to life, death and human endurance. I framed the scene with the skyscrapers in the background, the glass towers providing a distant echo of their homage. This picture redeemed the day for me. A post on Tokyo conveniences would not be complete without a blurb on toilets. The first time I visited Japan in 2009, I was startled by the toilets. Almost as much as I was by the Beijing toilets, but in a totally different way. Whereas the Chinese squat toilets forced me to get reacquainted with the basics, Japanese toilets scared me with their advanced electronics. Japanese toilets are decked out with heated seats, water sprays, air dryers and music. The heated seats are kind of nice, especially in winter and after you get over the first-time shock. The water sprays are mysterious – they’re automatic sprays to wash your netheregions. How they work I’m not sure – I’ve never been brave enough to look and risk a facial. The air dryers are practical, in theory. The music is just wierd. Apparently some Japanese like their privacy so much, they play music to distract eavesdroppers. So make that two notches on the weird scale: toilet music and eavesdroppers. My Japanese has not improved much over the years and my experience with new and improved toilets was interesting. Normally the buttons are labeled with instructions and graphics. Rarely are they written in English. In my recent visit, I was bewildered by additional new buttons. My problem was I couldn’t tell which was to flush. On the up side: one of the buttons was a speaker phone to get help. Toto is the leading maker of Japanese toilets. They have a Tokyo showroom which we’d attempted to visit but didn’t because they’d changed addresses and we were hopelessly lost. I wish now that we had tried harder. Apparently they have a poo-powered motor bike on display. 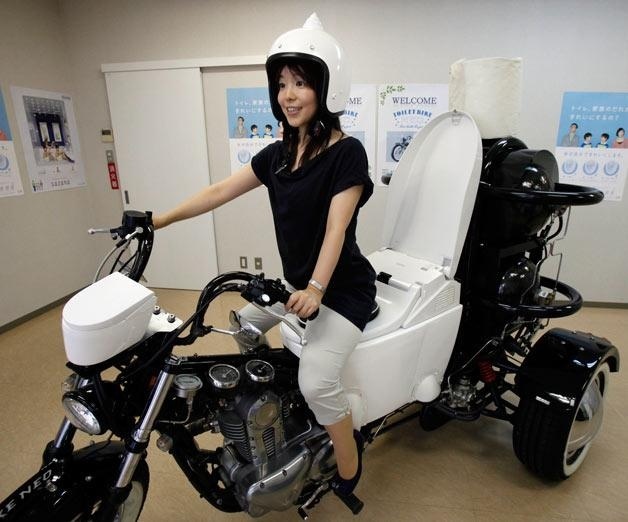 Despite its design, the Toilet Bike Neo is not actually powered by human waste. The three-wheeled 250cc motorcycle runs on a biogas fuel, which is fertilized, purified and compressed from livestock waste and household wastewater. Toto revealed the bike in a 2012 media release (see DigitalTrends article here) but didn’t share its general production plans. I didn’t see any on the streets of Tokyo. Thank goodness for neighborhood convenience stores. At home in Toronto, corner stores like Mac’s Milk & 7Eleven are few and sparse. In the olden days (before my car, mortgage and super sized refridgerators) I used to make regular runs to Mac’s for milk and midnight snacks. Milk, snacks and lottery tickets seemed to have been their main purvey. However, with the advent of 24 hour mega drug stores selling groceries, pharmaceuticals and stamps and gas stations providing petrol, coffee and doughnuts, it’s no wonder that these convenience stores are slowly disappearing. In Singapore, Cheers and 7Elevens are found in every train station. They sell everything from sandwiches, mobile cards and parking coupons. In the rainy season Cheers is my main supplier of umbrellas. In Tokyo they take it up a notch by selling railway tickets, bento boxes and emergency supplies of chapstick, socks and neck ties. Yup. Neck ties. I guess it’s a common enough occurrence for Japanese salarymen to need replacement neck ties. Maybe after an all-night bender at the local izakayas or all-you-can-drink nomihodais. 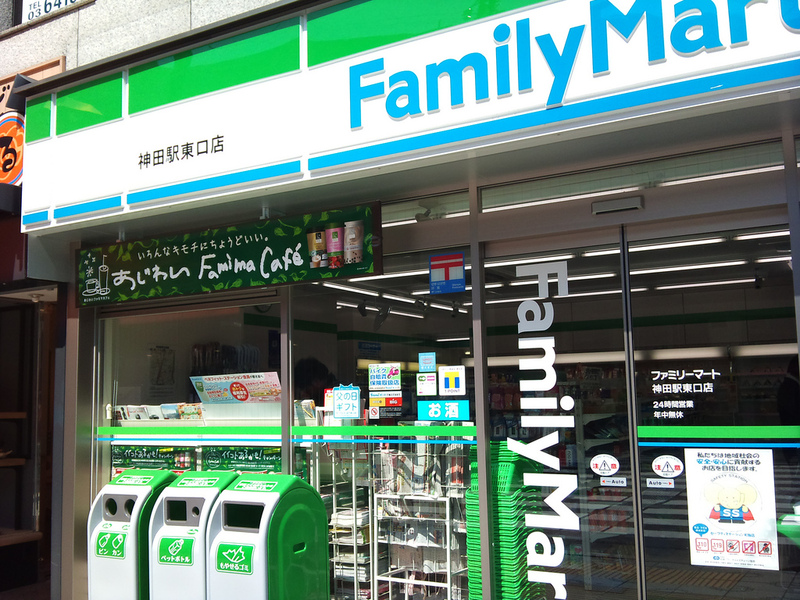 Personally, I relied on Tokyo’s FamilyMart for my daily lunch selection. My favorite was freshly fried chicken for the nifty price of 180 Yen ($1.80 USD) a piece. Aside from being cheap and tasty, it came with typical Japanese style packaging. We were on our way to Nishi-Shinjuku to see the famous Toto showroom in the L Tower and the Pentax Forum in the Mitsui buildings. We’d wandered around the labyrinth of underground walkways, craning our necks to peer at the over head signs for direction. So much so that we almost missed the iconic Shinjuku Eye scuplture at the west exit. Actually we did miss it on our first pass through and only by accident on our return trip, did I see it. The glass sculpture was created by Yoshiko Miyashita in 1969. Made of organically curved glass, revolving lights give it a vivid and mesmerizing quality. Capturing the light and reflection against the river of people walking by proved to be challenging photo shoot. Luckily (and it was pure luck) I happened to get one good shot. Tokyo comes alive at night. The brilliant lights and constant motion have a vibrancy that is uniquely Tokyo. The night sounds different according to neighborhood. In Ikeburo it is quiet with the rush of people heading home or students disassembling into groups heading into town. In Shinjuku the Takashimaya Times Square pounds with high tech music and sky high commericals. In the narrow lanes of Omoide Yokocho, laughter from relaxed salarymen spill into the alley and mix with the hazy smoke of yakatori grills. Always, in the distance, overhead or felt through the ground, the rumble of trains remind you that this is Tokyo.